With the London Olympics in full flow and after we have witnessed such a breathaking and stupendous opening ceremony, I thought I would look back at one of the few films I know that deal with the subject – and this is indeed a fifties film. 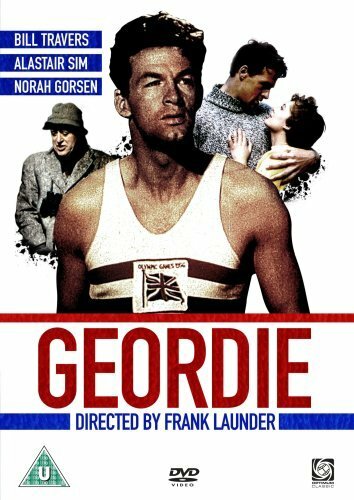 The film is sometimes called ‘Wee Geordie’ about an undersized young lad who spends his savings on a Charles Atlas type body building course to increase his height and improve his strength. This proves to be so successful is he that he is chosen in later years to represent Britain in the 1956 Melbourne Olympic Games and wins gold in the hammer throwing event. This is a simple tale about sheer hard work and dedication. 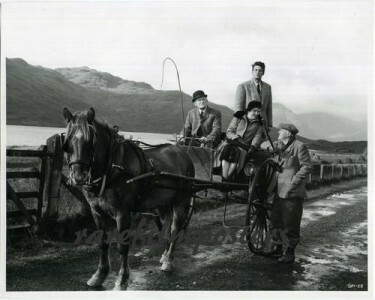 Bill Travers plays the lead role as Geordie with a dour expression which breaks into a winning smile when things turn out well. Nora Gorsen plays Jean his childhood sweetheart who urges him to accept the Olympic challenge and provides the female lead. She is an actress that I have never heard of before who actually hails from Devon. 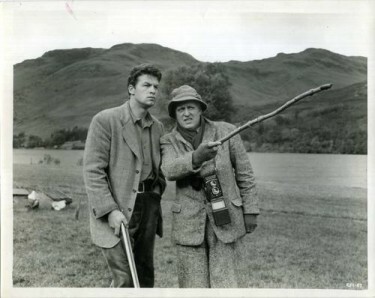 Alistair Sim in one of his later roles, is excellent as the laird as he always was indeed. Francis de Wolff as Samson is the man who prepares the correspondence course and thereafter seeks loudly to gain full credit for the success. He appeared in Treasure Island among many other roles. There is a hilarious scene at the railway station when he says goodbye to Geordie on his trip to Australia. Filmed in ‘glorious Technicolor’ this is a lovely film and a joy to watch. This scene shows Alistair Sim giving advice to Geordie – Bill Travers. It is a pity that the stills I have are not colour ones which I find strange because in 1955 the fact a film was In Colour was a bonus and as these stills are to promote the film you would have thought they would have been.